The first five chapters of Tomi Adeyemi’s Children of Blood and Bone are the most stressful things that I’ve ever read. And believe me, they’re so worth it. When I first heard of Adeyemi’s success and talent (the bidding war and the upcoming movie), people were comparing her to George R. R. Martin. I get it. I do. At this point, when faced with an epic fantasy series full to the brim with political intrigue and the kind of vivid writing that leaves you able to visualize the world, Martin’s works are kind of the “go-to” for that sort of thing. In the five-chapter preview, we’re introduced to three very different characters in different roles of life. There’s Zélie, a diviner trained to fight against the guards that oppress her and others like her in the name of King Saran. Then, there’s King Saran’s two children: Amari, who comes face to face with ugliness in her family, and her brother Inan, a young man who appears to be torn between duty and desire. All three of the POV characters introduced in the first five chapters are fascinating figures that I want to know more about. The world they live in is dark and distressing, but even in these five chapters, I got the feeling that we’re going to see so much more unfold as the book (and subsequent series) goes on. I think that the best thing about The Children of Blood and Bone is seeing multiple characters on the page that look like me and my family. Epic fantasy series aren’t exactly known for their stunning racial diversity and it’s been hard to get into the subgenre of fantasy considering it’s yet another one that I can’t picture myself in. But I can with this book. I can visualize the characters and the setting they live in without having to jump through hoops like whoa. I know that when the movie comes out, it’ll be like Black Panther where I sob all over the place from the first trailer on (but better) because Black people – especially Black women – don’t get to be the Chosen One. We don’t get to save the day or have a prince (maybe) fall in love with us. And Adeyemi delivers in a big way. You can check out the synopsis for Tomi Adeyemi’s Children of Blood and Bone on her website along with the first few chapters of the novel. If you read the preview and like what you see, consider not only pre-ordering the book, but spreading the word! 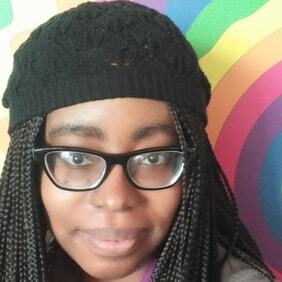 This entry was posted in Book Reviews and tagged book reviews, Children of Blood and Bone, Epic fantasy, fantasy, small stitch reviews, Tomi Adeyemi. Bookmark the permalink.